Why Windows 10 close my programs at program start? Windows 10 sometime close a program and then notify you if it determines that the program is either a security risk or incompatible with Windows-10. If you trust some of the programs, you can add it to an exceptions list in the DEP! If you want to change the settings in DEP, please run the command control sysdm.cpl,,3 in Windows 10 RUN-Dialog! 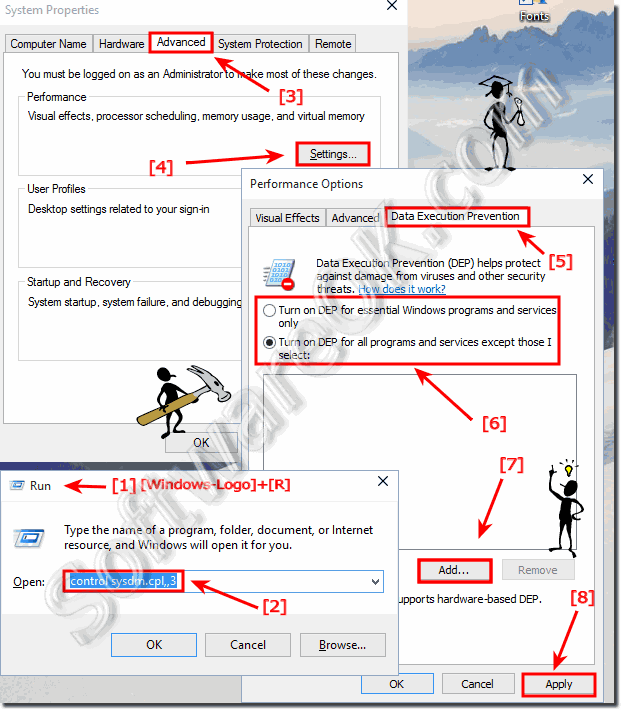 (Image-1) Customize DEP settings in Windows-10! When Windows 10 closes a program because of a security risk, it's because some programs might use your computer's random access memory (RAM) in a way that could be exploited by a virus and harm your computer. Windows-10 Data Execution Prevention (DEP), a security feature of Windows 10, tracks how programs use memory. If DEP finds memory being used incorrectly, it will close the program and let you know. If you trust the program, you can add it to an exceptions list so that DEP won't close it, but you should first check with the manufacturer of the program to see if there's an updated, DEP-compatible version available. When Windows 10 closes a program because of compatibility issues, it's because some programs could damage Windows 10 if you try to run them. If Windows 10 detects that an incompatible program might harm your computer (for example, by damaging important system files), it will close the program and notify you. Check with the manufacturer of the program to see if an update is available, or check Action Center in Control Panel to see if a fix from Microsoft is available. Windows-10 - FAQ-101: Why Windows 10 close my programs at program start? Where are other Windows 10 features, how to activate it? Mouse pointer shadow in Windows 10, (enable, disable)? Where is the Windows 10 Start Sound, Logoff, Logon (enable, activate)? Dep registry settings, windows 10 HOME 64 bits? Where can i find dep settings in windows 10? Dep settings w10, how can i change / adjust DEP settings on Windows 10 and Server 2016? Setting dep windows, how do i change the DEP settings? Change dep settings, how to modify dep? Windows 10 can't change data execution prevention settings? Data execution prevention dep setting to adjust on Windows 10? Change dep to always off in windows 10? Windows 10 performance visual data excution prevention proper settings? Changing data execution prevention settings? How to fix data execution prevention win10? How to change data execution prevention settings can i setup? Windows 10 Change Data Execution Prevention settings? How do you change DEP default memory? Change data execution prevention settings windows 10? How to modify data execution prevention settings in windows 10? Data execution prevention windows 10? Change data execution prevention settings? DEP setings in MS Access on Windows 10 and Server 2016? Windows 10 data execution prevention group policy setting? Where is the DEP setting Windows 10? Windows 10 data execution prevention registry setting? Change data and execution prevention settings or setup program? Windows 10 professional change data execution prevention? How to tell if DEP is turned on in Windows 10 registry setting? Windows change file execution options? DEP the data a execution protection setting? Windows 10 application starts closes? What is the name of the native Windows feature that closes the program and notifies you when it detects a program on your computer using memory incorrectly? Application closing after startup in windows 10? Software starts and closes windows 10? Change data execution prevention settings windows 2008? Data Execution Prevention: frequently asked questions Change Data Execution Prevention setti? Data execution prevention dep settings in windows 10? Windows 10 Data Execution Prevention? Where is dep in windows 10, change Data Execution Prevention settings windows 10? DEP settings, which programs are not compatible with DEP? Data Execution Prevention (DEP) programm download to adjust on win 10? Data execution prevention windows 10 dep? How to adjust DEP settings in windows 10? To calibrate DEP settings in windows 10? Customize Data execution prevention windows 10? Windows 10 data execution prevention settings? Setup Set data execution prevention in windows 10? Changing data execution settings in windows 10? How to change Data Execution Prevention (DEP)?